Yogarishi Swami Ramdevji was born to Smt. Gulab Devi and Shri Ram Niwas in a village of Haryana . He had his early education in a village school. At the age of 14 he was admitted to the Gurukul at Kalwa (near Jind, Haryana) where under the blessed tutelage of Acharya Shri Baldevji he studied Sanskrit and Yoga, and earned a postgraduate (Acharya) degree with specialization in Sanskrit Vyakarana, Yoga, Darsana, Vedas and Upanisads, later he was very much inspired by the life and writings of Maharshi Dayanand and he thoroughly studied Satyartha Prakasa, Rigvedadibhasyabhumika etc. Along-side the magnetism of Maharsi. 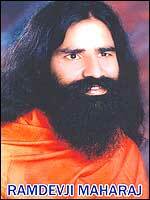 Patanjali as an exponent of Yoga, Sanskrit Grammar and Ayurveda continued to exert its influence on him. Quite early in his life he had his goals cut out for him, so he chose the path of celibacy and asceticism. 2. Reforming the social, political and economic system of India . And then luckily he met with Acharya Balkrishna, a kindred soul and a schoolmate, who was out there on a similar quest. They came together to launch upon this stupendous task from scratch. 1. Yoga Sadhana evam Yoga Chikitsa Rahasya, 2. Pranayama Rahasya. In his yoga camps, attended by thousands of participants from all parts of the country, he emphasizes on doing eight Pranayamas (1.bhastrika 2. kapalabhati, 3. bahya/ agnisara, 4. ujjayi, 5. anulomaviloma, 6. bhramari, 7. udgitha, 8. pranava), some suksma (light) vyayamas; and some specific asanas for various ailments, as also some simple home remedies and ayurvedic medicines. Within a short span of time the results of yoga and ayurvedic therapy have not only been encouraging but also astounding. People have taken to yoga in a big way; they are doing it under the guidance of yoga teachers trained and certified by Swamiji's Patanjali Yogpeeth, and watching and following it on various Indian TV channels, like AASTHA, ZEETV, STAR, SAHARA etc. People are learning yoga from the CDs, DVDs, audio-video cassettes prepared by the yogpeeth, Swamiji has tried to explain the Yogasutras of Patanjali in simple Hindi in his book Yogadarsana. With a view to giving concrete shape to his dreams Swamiji, first of all, founded Divya Yog Mandir (Trust) in 1995 at Kankhal, Hardwar, Uttarakhand, India, which was followed by Meditation Centre at Gangotri in the Himalayas, Brahmakalpa Chikitsalaya, Divy Pharmacy, Divya Prakashan, Divya Yog Sadhana, Patanjali Yogpeeth (Trust) in Delhi in 2005, Patanjali Yogpeeth, Hardwar, Mahashaya Hiralal Arsh Gurukul, Kishangarh Ghaseda, Mahendragarh, Haryana, Yog Gram and recently Bharat Swabhiman (Trust) in Delhi. While yoga will take care of physical, mental and spiritual health, the downslide, in social, political and economic system of the country will be salvaged only through the patriotic zeal, fearlessness and strong character, of which he himself is a living example. Recently he has launched Bharat Swabhiman Movement which encompasses all the ground realities of the Indian social, political and economic scene. He has given a clarion call to the people to come forward and save the country and the democracy. He wants to see an addiction-free, vegetarian, corruption-free India , proud of its swadeshi products. His mind may be soaring in the ethereal spheres of spiritualism, but his feet are firmly planted on earth where he is very much alive to the mundane concerns such as treatment/ enrichment of soil, cow breeding/cow protection, cleaning the Ganga etc. For his epoch-making work various honours/ honorary doctorates by universities have been conferred on him in India and abroad. On the invitation of Secretary General of U.N.O., Swamiji has led the stand up programme to pass resolution against poverty eradication from the whole world, at United Nation Organisation's head-quarter in New York , on 15 october 2006.